How Many Calories Are There in a Khakhra & Does It Have Any Health Benefits? Khakhra is a round shaped, cream colored, crispy and thin cracker. It is a popular Indian food of Gujarati cuisine. Khakhra is an easy and quick snack which can be prepared at home or purchased from the stores. It is made by roasting the soft phulkas on a heated pan with the help of a cloth or a wooden press until it turns crispy brown. 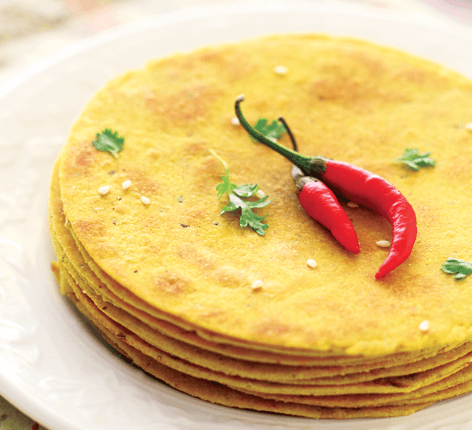 Khakhra is prepared from wheat flour and oil. It is served in breakfast. Khakhras can have different varieties based on what you add to it, such as Fenugreek, Cumin, Bajri, Ragi, Pudina, and Ajwain. Khakhra is a healthy snack that can be enjoyed with pickles, tea, milk, fruit jam and green chilli sauce. You can also melt ghee and add on it or have some chat masala or methi masala powder sprinkled over the khakhra for a sour flavour. It is rich in carbohydrates which are the energy suppliers of the body. The presence of proteins enhances its nutritional value. The dietary fiber content helps in weight reduction and maintaining blood sugar levels. It also promotes digestion. It is a good source of vitamin B, vitamin E, magnesium, iron as well as vital antioxidants. When wheat is combined with other flavoring ingredients such as Fenugreek, Cumin, Ajwain its nutritive value increases. Ragi is the rich source of Calcium and consuming it in a daily diet helps to strengthen our bones and teeth. Bones lose calcium as we age. Hence, a calcium-rich diet is important to regain the bone strength and bone density. Nachni Khakhras help to maintain your calcium level. Next articleHow Many Calories Are There in a Jalebi & Does It Have Any Health Benefits?